Behold that mighty marvel of miniaturization: two speakers, cassette tape recorder, AM FM radios, equalizer – the Boom Box. A whole audio visual system you could carry around with you. Or use as your main home audio system, if you weren’t a serious audiophile who didn’t need something to play vinyl records with. 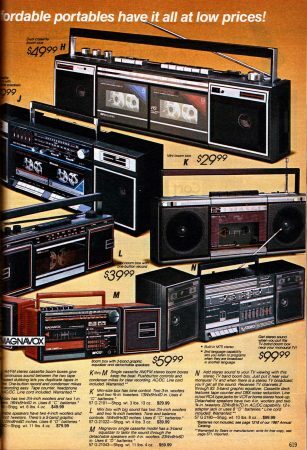 Leaving a boombox plugged in to AC often made more sense anyway, since these things could chew through batteries – typically 6 to 8 big D cells at a time. Nothing rechargeable here. If you were feeling flush and really modern, you could buy a fancier boombox with one of the new CD players, but that bumped up the price by a hundred dollars or more. 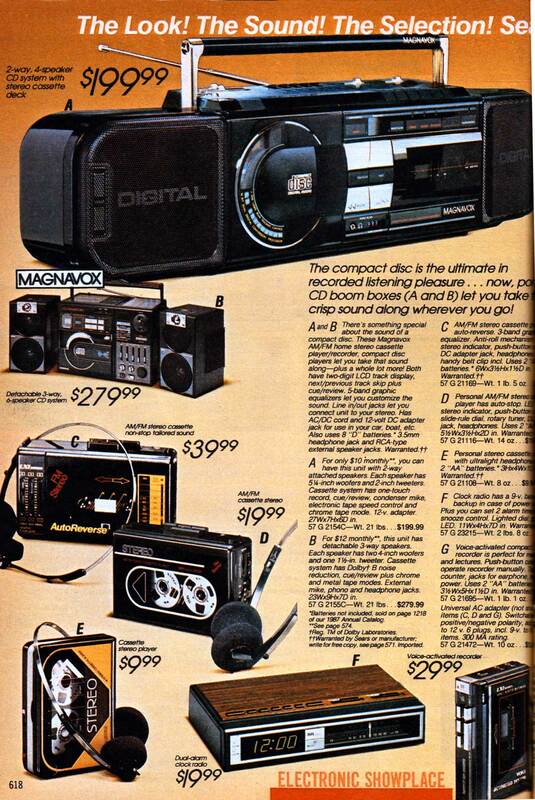 Also lurking on this double-page spread were a few “Walkman”-style portable cassette players, inexpensive and not nearly so desirable, but perhaps a closer predictor of our current smartphone-and-earbuds lifestyle. After all, how many people are walking around with boomboxes (or bluetooth speakers) on their shoulder these days?